Finding world-class food and expertly crafted cocktails in New Orleans on any day is a breeze, but who can resist the lure of trying the best cocktails this city has to offer at a nice discount. The French Quarter-based bars and restaurants we recommend below take it up a notch in terms of the quality of the ingredients and the inventiveness. 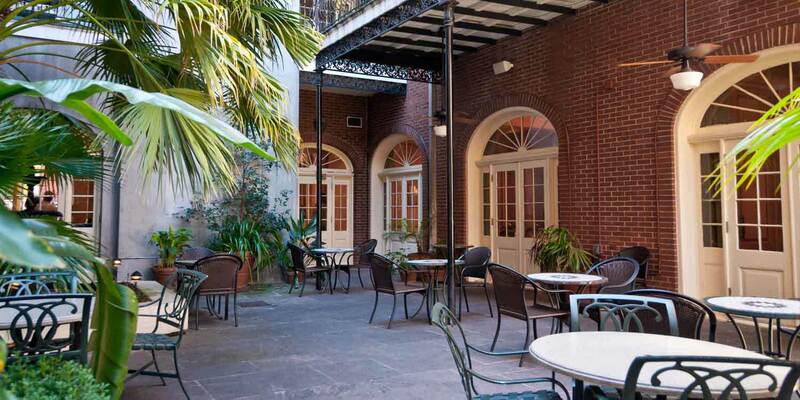 Vacherie’s restaurant, bar, and cafe are located next to one another on the first floor of Hotel St. Marie. The restaurant serves authentic Cajun cuisine with a few inventive twists. The $5 bar menu includes Seafood Etouffee, spicy chicken poppers, deviled eggs, gator sausage that comes with Creole mustard, pickled vegetables, and grilled French bread. You can also try the slider of the day special. 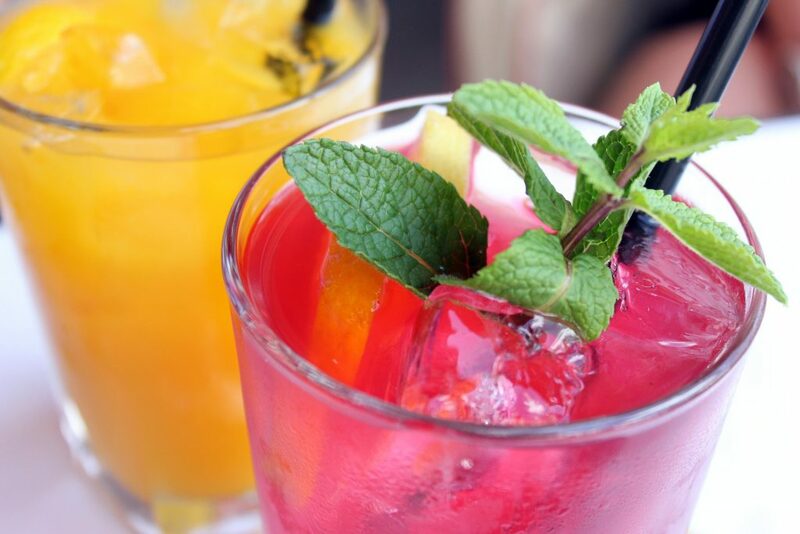 To drink, $5 will get you a Mojito, a Rum Punch, a glass of any of the house wines, or a draft beer flight (three half-pints of your choice). The Bombay Club inside the Prince Conti Hotel has more than 50 specialty cocktails on the menu. Happy hour features select $3 beer and wine and a $5 cocktail of the day. The $4 small plates from Executive Chef Phillip Todd are fresh takes on Cajun and European comfort food: Boudin Rangoons, Cajun Poutine with pimento, pork belly tacos, and house-made pretzels with Guinness cheese dip. Come for the martini made by Head Bartender Blake Kaiser, and stay for the live music! This beautifully appointed bistro on N. Rampart St. serves a refined cocktail and a variety of eclectic, beautifully executed small and large plates. The menu is high-end French comfort food with local nods, such as escargots, smoked Gulf fish, grilled sweetbreads, and fried oysters. A cheese plate or tasting plate daily specials selected by the chef (3 for $17/5 for $28) will go well with a $5 champagne cocktail or a Tom Collins. Happy hour also includes $5 wines or beer-and-a-shot combos. Mondays feature Chartreuse specials 5-10 p.m.
Kingfish keeps it somewhat traditional with its focus on Louisiana cuisine like seared Gulf fish and gumbo, and classic cocktails like the Sazerac, Vieux Carre, and Mint Julep. The cocktail menu, overseen by bartender Justin Gerhmann, also goes beyond those with quite a few signature drinks. There’s a valiant effort to support local wineries, distilleries, and breweries, so Kingfish is a good choice to sample these Louisiana products at happy hour prices (half off beer and wine by the glass). Small plates from Executive Chef Jason Klutts are all $5 and taste as delicious as they sound — boudin balls, chicken and sausage gumbo, and pork crackling. In addition to the $5 daily specials (whiskey flights Tuesdays and caipirinha Thursdays, for example), there are $5 cocktails from noon to 5 p.m. on weekdays. Some are unique to the bar; others are modern twists on the classics, with welcome deviations and house-made syrups. The award-winning and accolade-gathering French 75 sports a vintage bar, custom built in the 1800s for another restaurant and eventually acquired by Arnaud’s owners, and has come a long way from being the restaurant’s “gentlemen only area” back when it was owned by the Cazenave family. 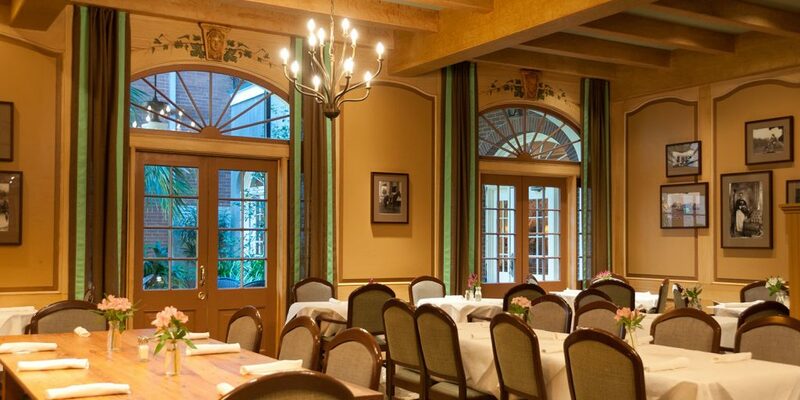 As iconic as the Creole restaurant itself, French 75 serves classic cocktails with high-shelf spirits and offers a bar menu featuring shrimp spring rolls, oysters en brochette, cougeres, and shrimp and andouille calas. The Friday happy hour offers half-price wines and $5 specialty cocktails. Brennan’s elegant Roost Bar emphasizes the bubbles for its happy hour, with premium bottles and half bottles available at half the price, plus several specialty champagne-centered cocktails for $7 each, complemented by the bar menu in the $7-$12 range, but topping at $35 with caviar nachos. The bar food includes house sliders, pommes frites, BBQ shrimp pot stickers, and other takes on “elevated” Creole cuisine. There’s also champagne sabering every Friday at 5 p.m. in the lush courtyard, which is a sight to behold in itself. Speaking of bubbles, the French Quarter now has a champagne-centric bar to call its own. Effervescence opened its tall doors on N. Rampart St. in March of 2017 and has become the destination for high-to-low sparkling wines from all over the world, champagnes, small plates, and live music. There’s a full bar and dozens of still wine by the glass and bottle, plus a very limited beer selection (the owner Crystal Coco Hinds is the sister of NOLA Brewing founder Kirk Coco). The spotlight, however, is on the champagnes, cavas, and proseccos of the world, from mind-bogglingly expensive champagne from the famed houses to artisanal, natural, and the lesser-known iterations of the bubbly, like Hungarian Tokaj and Lambrusco. Also, prosecco on tap? Yes, please. You can order half-glass flights hailing from all over the world in a range of prices. The place itself is airy, spacious, and polished, with lots of sunlight and a brick patio if you want a quiet conversation. The food menu is meant to be paired with the bubbles, of course, and aims to please with small plates of grilled octopus, American caviar, cheese, and pommes frites.